The book of Ruth is a story of how God restores the empty and brokenhearted. He is a God of second chances that renews us in his steadfast love. Join us as we desire to experience the grace of this God by exploring the story of Ruth. I want to invite you to turn to the Book of Ruth. You’re gonna want to follow along this morning because we’re gonna hit the theme of what really Ruth is all about. We’re gonna look at the last few verses of this book and highlight really two verses and show how these two verses paint a major theme throughout Scripture. A theme that if you ask me what is my favorite theme in the Bible it would be related to what this passage is going to be in today. I’m gonna leave you in suspense until we get there. You think about the Book of Ruth as we go into this story together. All right, it’s a book that begins with tragedy, ends in triumph. It’s a book that starts with darkness, walks into light, from weeping to celebrating. Ruth and Naomi were two individuals that were impoverished, no food to eat, no money to make ends meet. They were broke and broken, not just financially but also relationally. They went to Moab away from God’s people and in that journey found death. Spiritually away from God’s people for 10 years they experienced three bad marriages, which we saw with Elimelechm, Mahlon, and Chilion and them not being aligned spiritually. It led to sickness and Naomi ultimately was facing death. Ruth knew that Naomi was facing death if she returned to her homeland alone. Ruth gives this statement and when we think about the Book of Ruth it’s probably the most famous passage out of these four chapters where Ruth says to Naomi, “Where you go, I go and where you die, I will die. Your God is my God.” Inevitably what she’s saying is, “If you die, I’m dying with you because I’m gonna put my faith in this God in which you also trust.” They put God to the test. In death in the Book of Ruth we see there is life. First, somebody kind of give the idea this book as being a great testimony and in given the idea of a testimony towards this book this person went on to explain the difference between a biography and a testimony. If you think about the context of this story, Ruth is prepared to die. Naomi is bitter. They return to the land of God’s people, the promised land because they heard God had visited them. When you think about that in terms of biography and testimony. A biography is about what you have done, but a testimony is about what God has done when you are unable. It’s on the backdrop of that thought in Ruth Chapter Four you see how this story starts to wrap up with this idea of redemption from darkness to light. When Ruth is married to Boaz it tells us in Verse 13, “So Boaz took Ruth and she became his wife and he went into her and the Lord enabled her to conceive and she gave birth to a son.” Beautiful story of two people that loved God and want to follow him.We’ve seen just the theme of this discussed in Scripture in Chapter One. We highlighted, “It’s better to be single and free than married and miserable.” You look at the story of Ruth as it begins with Elimelech, Mahlon, and Chilion. The two sons named Mahlon and Chilion literally mean sickness and death. In Chapter Three we talked about singleness is better than sinfulness. How Ruth comes into the room in Chapter Three on the threshing floor and throws herself at Boaz. Boaz treats her with integrity although she may not have had the highest integrity in those moments. In Chapter Four the story in Ruth is telling us that there is hope in second marriages. God’s not finished just because one part of your story may have been filled with the despair and darkness or sickness and death. There’s still hope. In Chapter Two, which I skipped, but Chapter Two is this, it’s us looking for this idea of a testimony, which we said, “It’s God working in us when we are unable to do it within ourselves. In Chapter Two, Ruth goes to this promised land and she doesn’t know how things are going to work out. In fact the concern between Boaz and Naomi is Ruth she could face a lot of abuse if not death. But Ruth just didn’t sit on her hands waiting for God to move, she walked by faith looking for open doors for the Lord to provide. This picture of a redeemer is really a picture throughout the Bible that’s highlighted in the Book of Ruth. When you read it just there’s this word of redemption throughout these four chapters of this story. God’s picture of redemption keeps growing bigger and bigger as these individuals in this book walk by faith. In Ruth, in the beginning of Ruth, when Naomi experiences the death of her family, Ruth steps in as sort of a redeemer towards Naomi in helping provide for her. Then Boaz becomes this kinsman-redeemer in being able to provide for both Ruth and Naomi. Now in Chapter Four Verse 15 you see another story of a redeemer emerging in a story as this child now from these women are spoken from these women to Naomi as being a redeeming child or a redeemer. This child it says, “Sustains Naomi in her old age.” What it’s saying here is Naomi doesn’t have to worry about her future. In Israel’s day the older generations looked to the younger generations as they began to age to be the care givers within the context of their family. Now that the lineage has continued on, Naomi finds this redeeming hand of this child as being one that can sustain her into her older years. Then it says in Verse 16, “Looking at the giftedness of what this moment is by God it says, “Then Naomi took the child and laid him in her lap and became his nurse.” This word for nurse is again the idea of a caregiver. When you think about this picture of Naomi now being a grandmother. I am not a grandparent, but as a parent I have observed this grandparent position in action. I got to admit from my point of view grand-parenting appears to be better than parenting. I mean why else would they throw the word grand in front of it, right? The grand-parenting here is what we’re talking about. You can, you may not necessarily do this, but you can enjoy the kids without the backside of dirty diapers and upset tummies. It’s kind of like you get to play with them and if something is a brewing you can pass them on, right? It’s not your responsibility, you’re the grandparent after all. I’ve watched this with my mother as she has carried out that role. I can’t tell you the number of times I’ve had to say, “Mom, you know if you don’t stop feeding them candy they’re going to release everything that’s gone into their stomach inevitably within a few minutes. Blah. There it all is.” Or, “Mom, kids don’t need 15 pairs of anything within their life,” or, “Mom, at some point ice cream for every meal just gets a bit old. We should probably stick something healthy in there, you know?” Grand-parenting. Here in this story Naomi nurses this child. This means that she sees this child as a blessing from God. No doubt kids are a gift. As one who is nursing and seeing the story of Ruth and Naomi being told now in generations, this book is being written well beyond the time of Ruth. It’s more in the time of David looking back to the history of Ruth’s life. Naomi sees this kid as a gift and she’s speaking life into them. She’s speaking life over them. She’s not just providing for them physically but she’s seeing what it means to walk with God spiritually. As Naomi and Ruth have done this now returning from the promised land and now she’s continuing to pour that blessing into life of this child. You know sometimes when it comes to parenting it isn’t always easy. Sometimes it can be more like surgery where it can be painful but you know the result is to produce health. The major question for all of us in this is just do you see your child as a gift? As a blessing from God? Recognizing as I even said last week that you get to make an impact in this world by the way you pour into the next generation. You toss the youngest state in America, as if God has gifted us an opportunity to make movement throughout our nation as we pour into our young people. The fact men and women as we began this story as I even pointed out for you that when it comes to understanding how God has shaped your family that while our church may have a pastor when it comes to your home, God calls you to be the pastor within your home. It’s like on the responsibility of the caring and overseeing of your children to show to them what it means to walk with God and when necessary to even perform surgery. I know when in the life of parenting it’s not about just walking behind your children and pointing out every wrong thing they do, which you will have opportunity if you’ve got kids to do that. When it comes to parenting if all that we do is correct misguided behavior or sinful behavior and we point them back to God in the midst of that, eventually what they’re going to be able to see in their steps is that God is a very nagging God. I don’t want anything to do with him. He’s only there when there’s something going wrong in my life and to tell me how I’m wrong. I think it’s important when we look at the totality of parenting it’s not just about corrective behavior but it’s about reaching the heart of your child to see them nurtured into maturity. If we’re not careful in how we do this parents sometimes we’ll honor the things that may be worthy of honor but we’ll honored them in the wrong way. Let me just give you you an example. A child comes home and the report card is all A’s. You congratulate them on the success of all A’s. There’s nothing wrong with congratulating a child on a great performance a report card in getting all A’s if your child has the capacity to perform to that level in life. There’s nothing wrong with when the child brings home not what you know they’re capable of to encourage them to do differently. As a parent I think it’s more important to honor not just the act but also the characteristic. In fact, I’d say it’s more important to honor the characteristic of what will produce ultimate maturity in your child not just the result in the moment. As a parent sometimes I’ll give up the short game and that victory to look ahead towards the maturity in which God has placed me in the life of my kids to see that victory. Not always, I fail. That’s what God’s got me in their life to see happen, to reach for their heart and to encourage it when it reflects the characteristic of God in their lives. That’s what Naomi is in this story. This word nurse, it’s not just you provide the solace but it’s the totality of the well-being of this child under her care. She’s seen the beauty in the picture for what it is. I also love how it’s also talking about the honoring of the older generation, right? This redeemer will sustain Naomi into her old age. It’s great just to watch youth run around, right? To see the excitement and to remember the days when you could bounce off the ground like that too. I’m not that much far removed from youthful generations but I already when I go out to play sports with them recognize how my body used to do some things that it can no longer do. I tell them, “I used to be great in my day, you know?” But honoring the older generations, I love it the way Mark Twain used to say he said, “Youth is wasted on the youth.” There’s something to be said about that within the context of our culture, but as you go to some cultures today and they cherish older generations but for some reason in our culture we’re just fixated on youth. Everyone wants to be younger, instead of honoring the wisdom of the older generations. There’s a perfect harmony, a synergy here. The wisdom of the older generations. The older generations have something to say that’s worth listening to. The younger generations and they’ve got the energy to get it done, right? If we could pour that, just see that working in harmony together what a beautiful picture that becomes. I see that synergy in this relationship just being expressed in this passage of Scripture with Naomi as she’s thinking about the hope of the younger generation. She’s taking the time to invest in the younger generation and the future investing into her. A beautiful picture isn’t it? It’s called the, “Book of Ruth,” why? I think a lot of it has to do what’s explained to us here in Verses 15 and if I back up to read in just a moment in Verses 14. Verse 15, we’ll reread it in just a moment but Verse 15 it’s one of the most startling things you could ever read in an ancient document. The reason is, is it gives credence to a female and not just a female, it’s a female who’s a foreigner to the Jews. Not just a foreigner but she’s also an enemy to the Jewish people. That’s why they were concerned in Chapter Two for her well-being when she’s walking around this land. Here we are in this book it giving credence to this woman look what it says in Verse 15, “May he also be to you,” talking about this child, “A restorer of life and a sustainer of your old age for your daughter-in-law who loves you and is better to you than seven sons has given birth to him.” See in the context of ancient Israel to read this passage this would cause people to stop and literally goosebumps just raise on their arms just thinking about what’s stated in this passage. Ruth is better than seven dudes, right? Of course, she is. Could you imagine the grocery bill? What’s it saying here? Men are better than women? No, that’s not what it’s saying at all. Recognize in a society that women were often not treated as equal. They’re not treated as image bearers should be in the context of Scripture. We find in one of the things that was appealing in the New Testament when the message of the Gospel is proclaimed that it had a tremendous effect in the lives of slaves and the lives of women. It was finally elevating them in the positional words being created as equal image bearers in God. Here in this passage it’s doing this, this same idea with Ruth, not just a female though, a foreigner one who doesn’t belong. Not just a foreigner, an enemy. Then it compares her to seven sons. What’s so great about seven sons? Well in this text it’s important to recognize seven is a number of completion in a patriarchal society of sons, right? What it’s saying to us in this passage is that seven sons is actually a picture of a perfect family. What Ruth represents then is something more beneficial or better than the perfect family. That’s how great this idea of redemption transpiring in the story should meet us in our need in our life and I’ll reveal more why as we read in this passage. It’s showing us the reason this book is not called the, “Book of Boaz,” but the ,”Book of Ruth,” is because the significance of what’s taking place here in the idea of redemption through this woman who was a foreigner. Then it say in Verse 14, “And the women said to Naomi,” Bless is the Lord who has not left you without a redeemer today and may his name become famous in Israel.” Something unique is being expressed here in the idea of redemption through this kinsman-redeemer of Boaz. I remember we’ve looked at this thought of kinsman-redeemer last week and we’ve just peppered it throughout this message. When the author’s talking about a redeemer here through this kinsman, he’s not necessarily being true to the law. The reason someone was allowed to be a redeemer or the kinsman-redeemer is because they possessed what was necessary to buy someone out of their place of desperation. Boaz was able to be a kinsman-redeemer to Ruth because Ruth in her brokenness needed someone to, and Naomi in this moment needed someone to come in that could supply and provide. Boaz had the sustenance. Boaz could meet that need. That’s what a kinsman-redeemer does. Here in Verse 14 the author isn’t referencing that kind of redeemer. In Verse 14 it’s talking about a child. What can a child do? Then as if to explain it, Verse 17 to 21 goes on a little further. It says this, “The neighbor women gave him a name saying a son has been born to Naomi so they named him Obed. He’s the father of Jesse, the father of David. Now these are the generations of Perez. To Perez was born Hezron, to Hezron was born Ram. To Ram, Amminadab, to Amminadab was born Nahshon. Nahshon was Salmon, and to Salmon was born Boaz. Boaz to Obed. Obed was born Jesse, and Jesse, David. What’s it saying? It’s painting a picture of redemption. What it’s saying to you is God’s plan of redemption has been orchestrated from the beginning of time. God just doesn’t randomly intervene into Ruth’s life as to say, “You know what? You just need, probably need some rescue.” Rather he’s using Ruth’s story as a greater story for all of us and let me tell you why. Ruth is being written now, at least during the time of David, and the author of this story is looking back over the darkness of history that has just been recently written. Then when you see the people of Israel, the Jews, they go into this promised land that is given to them. Joshua goes on this conquest of taking over this land. Then right after Joshua happens, there’s this story of the Judges where the people go into darkness. We’ve even read in the story of Ruth the last verse in the Book of Judges it tells us, “Everyone does what was right in their own eyes. What that means is no longer declaring God as God, they declare themselves as God. When they wake up in the morning they answer the question, “What will make you most happy? Whatever that is do that.” What happens in that type of environment is you start to abuse everything in life as worthy for you to exalt yourself as god, even if it’s people. People just simply become tools to the worship of you and you’ll use and abuse. When the people of God see that type of demonstration in someone else’s life it brings them to a place of despair and darkness and wondering, “God where are you? God, do you care?” Someone with the story of Ruth is now going back to the period of Judges and is tracing this hand of redemption that started all the way back to the, “Book of Genesis,” to say to God’s people, “God is not finished with you. Even when you feel like life is darkness, God’s glory is still very desiring to be made known. That’s why this mini story of Ruth becomes a greater story of God’s redemption and that’s why in talking about a kinsman-redeemer at the end of this book it continues to trace the lineage of what would ultamately become Jesus that you can see the greater picture of God’s redemption for all people. It’s saying to you that Ruth is you. You are Ruth, one and the same. God’s hand of redemption working throughout history and a story built, Ruth, foreigner, bankrupt. God’s grace comes in through Boaz who is a kinsman-redeemer, which ultamately becomes a greater picture of redemption, which God wants to fulfill in all of the lives of his people. From death comes life, from darkness comes light. From funeral comes marriage. When God orchestrates his plan it’s not as if he slapped it together, but intentionally. Can I tell you one of the most compelling reasons in my life that every day I just want to wake up and draw near to God, at least I hope every day. It’s seeing the divine hand of God’s redemption laid out in Scripture. Over and over and over this theme is repeated leaving no room for speculation but to simply marvel at the hand of God as it’s laid its course throughout history. Now you think of how this story works where God calls a specific people group and says so we can all identity, “This is where the Messiah will come from.” By the way, if God were to label where his Messiah would come from, guess who the devil would be interested in stopping? When God pinpoints from a particular people group that this is where the idea of his redemption will be birthed and tracing this lineage. If you control darkness, what do you control it against? It’s satan working it’s this, when you read the Old Testament you see this spiritual battle taking place throughout the Scriptures with God’s people as satan tries to thwart the redemptive hand of God wanting to be made known. I love this in Deuteronomy Seven, Seven when God calls his people he says this, “The Lord did not set his love on you nor choose you because you were more in number than any of the peoples for you were the fewest of all peoples.” God works through the humble things of this world to accomplish his plan. He takes from Abraham and promises through him all nations would be blessed. Then he comes in Second Samuel Chapter Seven Verses 14 to 16 and he promisees the coming of the Messiah through this Davidic line. This thought of redeemer is just rich in Scripture. I wish I could go through all the Bible and just show you how this picture lays out but I’m only going to be able to give you a mini picture of the time that we have. God has been moving throughout Scripture building, building this theme. Can I just encourage you, if you want to just see the beauty of that beyond today. When you go to God’s Word if you want to just go to a starting point, I would say go to the Book of Acts and just read some of Peter’s or Paul’s sermons. Look at how they declare the goodness of who Christ is to people. When they share that message what they do is they trace the hand of God’s redemption. They articulate it so that people can see God’s divine plan as it’s laid out through the course of history. Can I add something else to that for you? Sometimes when we go through our Bible reading I think it’s important just to read a text of Scripture or a Letter of the Bible, that’s how the Bible was written. When you get to Colossians, Ephesians, Philippines, it’s just a letter. Read the letter. Okay. I want you to also understand when the New Testament writers write, they’re not just picking up from a brand new point and just starting with an idea. They understand that God’s divine hand of redemption has been tied throughout Scripture. When they write the New Testament, the New Testament writers are written by Jews. They understand it for the most part and they understand that when they’re writing that God’s great picture is being painted and so they quote from the Old Testament. The Jews have a word for this, it’s called, “Kesher.” It’s the tying of the Old Testament. It’s tying the picture of what God’s painting together. I’ll tell you if you want to just really enhance your Bible reading this will slow it down again a little bit, but it will also enhance it. 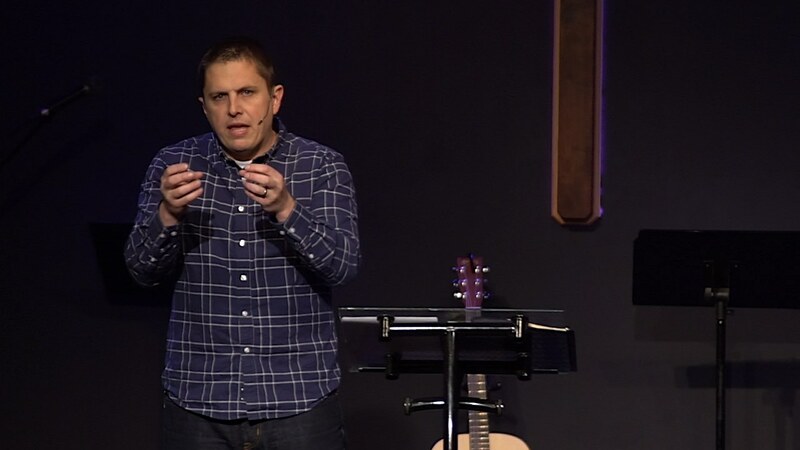 When you open up your Bible you’ll see in the margins all these verses references and sometimes we just read past that and we’re like, “That’s kind of cool, but I don’t know what that’s about.” What it is, it’s a tying of a particular verse and the author is tying that verse into an Old Testament Passage. The reason he’s tying it to the Old Testament passage is because he’s taking from a frame of reference for us to understand the greater picture of God’s redemption. When they take a quote from the Old Testament they’re not just saying go back and read the verse, they’re saying understand the section for which this comes from. You got to remember Jews recited and memorized the Old Testament. When they quoted, they quoted Keshers as if to say, “Remember this section of Scripture and the greater picture of what was happening?” That’s what I means here in the New Testament when I’m explaining this to you. If you take time to go back to the Old Testament the references there, they’re seeing in the Old Testament as to why they’re writing in the New Testament. It adds such imagery to the Biblical understanding that you carry forth from that section of Scripture. This idea of redeemer is just a powerful picture in the Bible. When the Jewish people would create these Keshers, when they would reference these words. The way these words were given their definition was from, based on their first reference in the Bible. When you think about this word redeemer before you think, “Okay God, how do they develop their picture of redeemer?” I would say it starts in Exodus Six. Exodus Six in Chapter Five this is or Chapter Six and Verse Five this is where Moses is called out. He’s called out in Chapter Three. He gets to Chapter Five, he feels like a failure, he comes to God and says, “God, what in the world are you doing? I don’t get this. I don’t think this is going to happen? Are you sure you picked the right guy?” Then in Verse Five God kind of peels back his grand picture for his plan. Now if you remember as God gives all of these promises, I will, I will, I will. It’s on his authority. It’s not on theirs. It’s on his promises, it’s not on theirs. When God gives this statement to Israel remember they’re slaves right now. Where do they find themselves being set free? First Passover. God’s going to redeem them. The First Passover is the final judgment that comes against Pharaoh and the Egyptians that allows the Israelites to be set free. This picture of redemption is now tied to that. Now here’s the grand picture as it paints itself, when you get to the New testament and John introduces Jesus for from first time. One of the very first words John says about Jesus, “Behold the lamb of God takes away the sins of the world. Passover.” John draws the picture of Jesus to this idea of redemption. Now you look at that word ransom, you’re like, “That’s not the word redeemer.” Here’s what’s important, Jesus is taking really two thoughts and tying them together here. This word ransom comes from the same word cluster as the word redeemer. The moment Jesus said this the disciples again they should have stopped. They understood the richness of this history. This is one of those goosebumps, hair stand-ups kind of moment. What’s Jesus saying? “Redemption’s here.” He’s giving his life as a redeemer. You think about kinsman-redeemer in this moment. Jesus has become flesh like you to pay a debt you could not pay. Just like Ruth, her life was darkness. She’s in a funeral of mourning, and in comes light and life. Hebrews Chapter Two, starting with Verse 14 to 18 ties a better picture of kinsman-redeemer about Jesus. Jesus says, “Ransom,” the word cluster from which we get the word redeemer. Then this word ransom is also, has a cultural meaning. I love how Jesus, how he can just or it’s like he’s God or something. You know how he can just takes one word and it can mean, it’s so rich and it’s understanding that Jesus just, he wants us to grab a hold of what’s being expressed here because this word ransom is also a cultural word that’s used in reference to slavery. In our culture we have different words for financial transactions, right? You go to the store you buy something, you get a receipt. You want to buy a car, you get a loan, and on top of that you create debt. All kinds of financial words we have in our society. In Jesus’ day this word ransom was a specific financial term used towards a specific moment. That specific financial term was used when they would purchase slaves off a slave market. It’s as if to say you could not buy your freedom, you were trapped. You were owned, but in comes Jesus, kinsman-redeemer, ransomed, redemption from slavery into life. When you think about the richness of redemption that’s spread throughout the totality of Scripture. According to God’s story of redemption in Ruth what it’s declaring to us through the life of Jesus is that, “I am Ruth.” I’m a bankrupt foreigner and God brings in his gracious hand. In my poverty, I become rich. Just the beauty of this word redemption as Jesus plays it out in the New Testament, it’s not just God just taking you off the slave market. It’s not just God rescuing you from something. It’s not God giving you a new identity for something, and that is in him. You think about this story of Ruth in poverty and having nothing to supply her life, worried about tomorrow. Now this kinsman-redeemer comes in, she’s married. Now what belongs to Boaz belongs to her. She’s rich. In Jesus life, it’s the same for you. It’s not just the rescuing from, but it’s the wealth of Christ poured out on your life. Why is that important? It has everything to do with the confidence you put in him. Tracing God’s hand of redemption is so important for us to see in Scripture because finding confidence in God’s commitment to you will inspire confidence in your commitment to him. Jesus is using a picture of marriage here. In Jesus’ day a young man would be betrothed to a young woman. That young man while they’re betrothed, she would go or he would go on. He would prepare a place for his bride and that’s where they would return and consummate the marriage together. What Jesus is saying to you is that, “You’re betrothed to him. He’s preparing a place for you that where he is you may be also. You are his bride.” You think about how much a husband is to care for his bride that’s what Jesus is saying to his disciples. Then he goes on from there, he says in Verse 18, “I will not leave you as orphans. I will come to you.” Like a good dad doesn’t say to his kid, “Look, sit on that doorstep and hope to God I come back. Just guess, guess whether or not I’m going to return,” right? Jesus is saying to his disciples he knows what’s going to happen to him. He’s about to be crucified. He knows what they’re about to endure, but he wants them to understand positioning where they are in him. “Look, I’m not abandoning you. You belong to me. You are my bride. You are my child.” Then in Verse 15, “No longer do I call you slaves ransomed, but look I call you friend.” Just think what does it mean to be called a friend of God? He’s my friend. He is my father. He is my husband. He is my redeemer.” The story that he’s painted in Scripture is so beautiful that from Genesis to the time of Christ, the hand of redemption is laid out over and over and over. God repeats it, why? Because, we all get to the place of Ruth. We experience death. We walk in pain. We need the light and life. Here we are in the story of Ruth in a time period in history around King David where they’re just looking back in the darkness and reminding all of us, “God’s hand is not finished yet.” The fact the story of redemption will continue to be told of which you yourself are Ruth. In the midst of darkness there is light. God will not leave you as an orphan but you are his bride, why? To find confidence in his commitment to you so that it will inspire confidence in your commitment to him. The story of redemption guys is the anthem of God’s people that we may celebrate what he has done in the course of history.